I have a large stash of beads and beading supplies. This included several tubs of costume jewelry, old and not so old, waiting to be recreated into something new. Many are bits that are broken; or earrings who have lost their mates; or beaded necklaces, out of style or missing clasps; but still all have great potential. 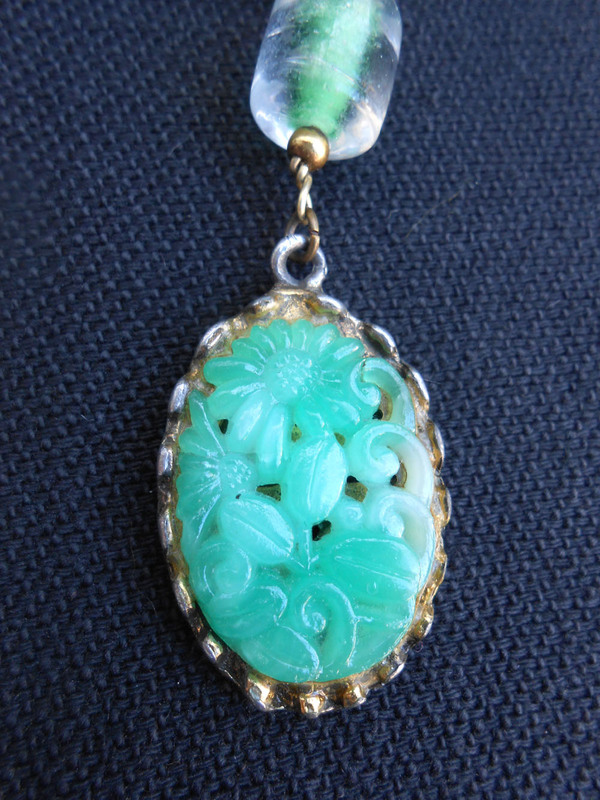 Digging through the stash, I was drawn to this piece first – a carved floral pendant with asian symbols on the back. It looks like it might be jade, but I don’t know for sure. I did know that it was the perfect piece to be the focal point of a necklace for my friend, Diane, who has Japanese heritage. I dug through more of my stash, pulled out beaded necklaces in golds, greens and blacks. I looked through all my green glass beads to find just the right shade, set them out and then found my go-to bottle of black glass beads. Black goes with everything. I didn’t use the necklace with the gold, green and purple beads, but I took apart the other two. I attached the pendant to a green/clear glass bead and attached that to a gold filigree bead from the now disassembled gold necklace. 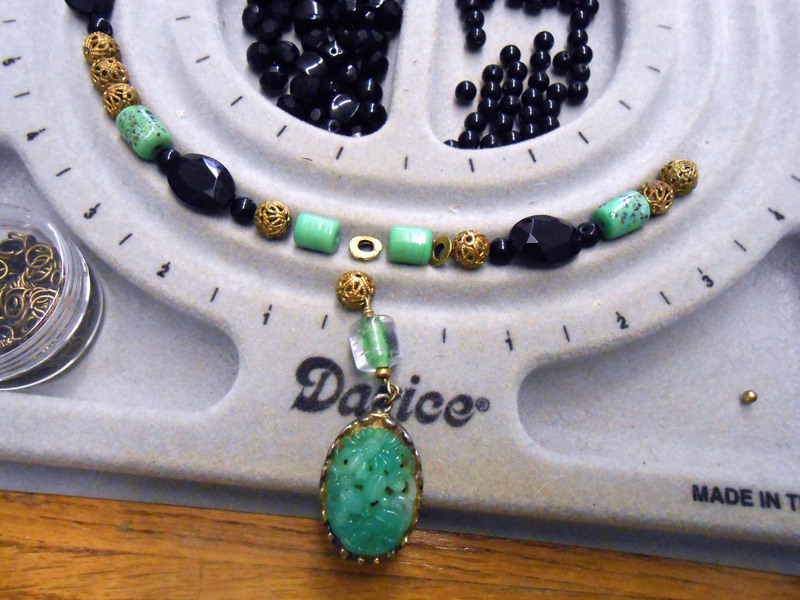 The layout began to take shape with large oval black beads from one necklace, the green glass beads, the gold filigree and tiny gold beads from the other necklace and lots of round black glass beads. 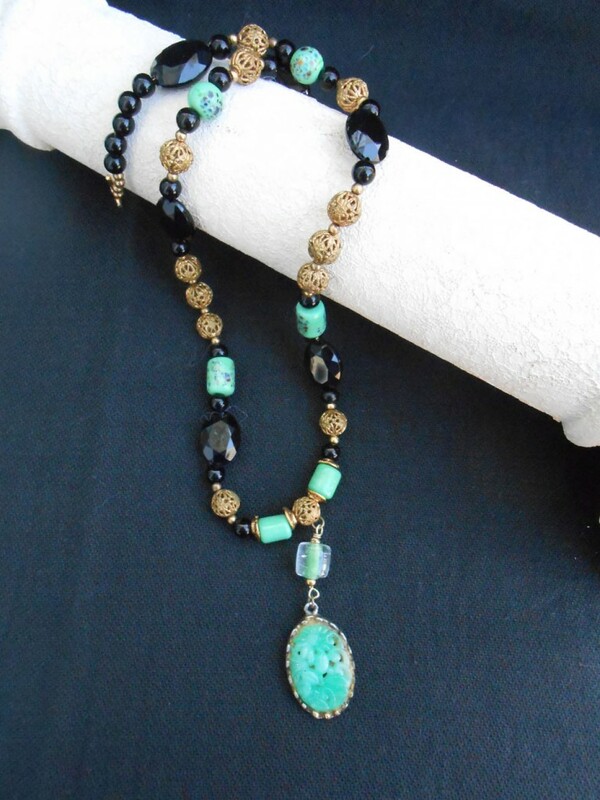 The completed necklace shows off the pendant beautifully, the rich black and golds interspersed with just a touch of the green. Another friend had a birthday the same day and we were celebrating them together. Back into the stash for new inspiration. 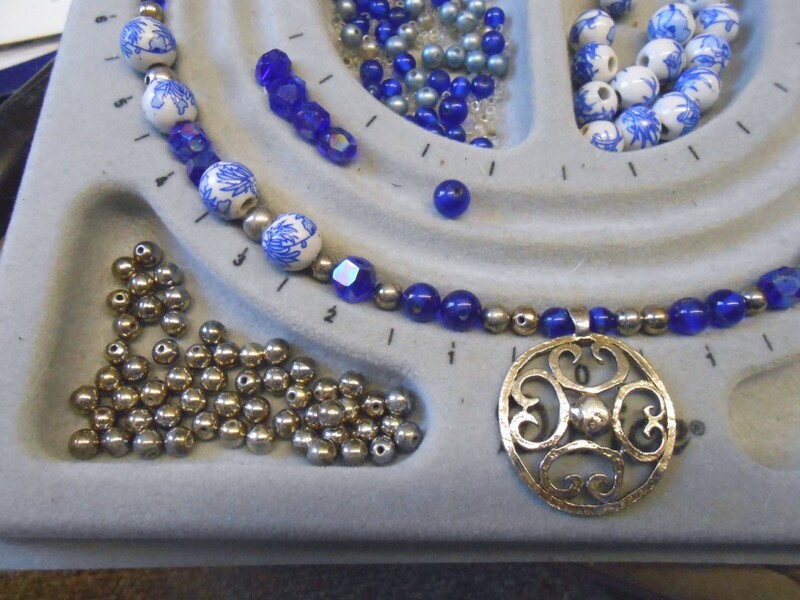 I found a silver toned pendant, a beaded necklace (marked Japan on the clasp), some porcelain blue and white beads and lots of round silver toned beads. Now to take apart the blue necklace and layout a new design, using the cobalt blue beads from the necklace, the porcelain beads and the round silver beads. 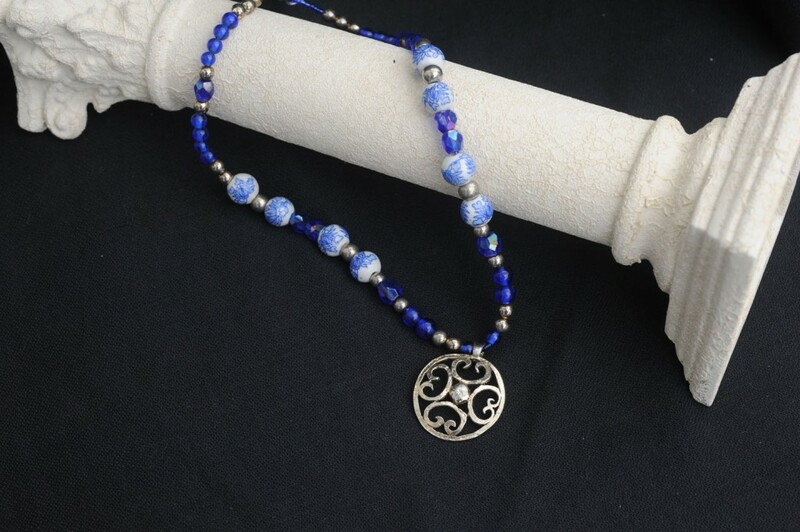 The blue and silver are a stunning combination and yet allow the pendant to take center stage. After I had given the gift, Nancy stated that blue is her favorite color. So, old bracelet you never wear because the style is outdated? Or necklace that has lost the clasp or begun to come unstrung? An earring who has long lost it’s mate? 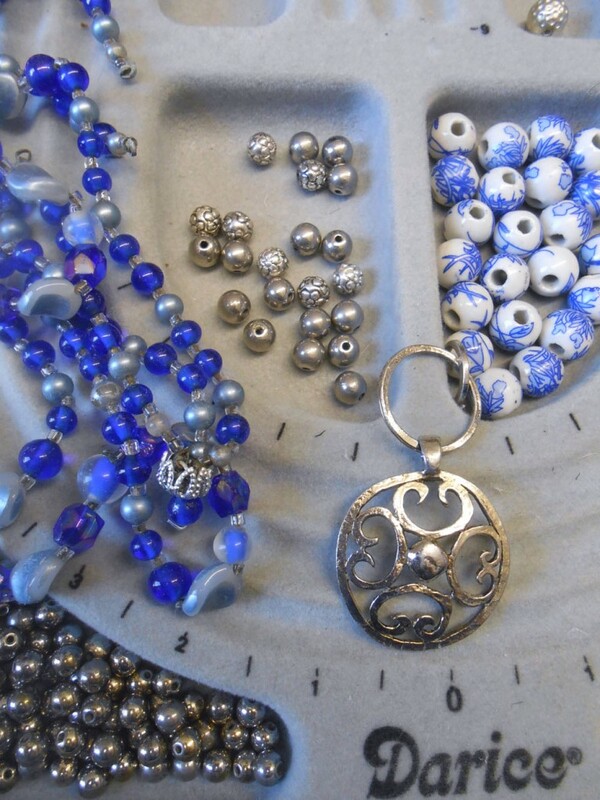 The great thing about beads and baubles is that you can restyle them over and over again. Take apart that necklace and use the beads for a new one, or just use some and create a pair of earrings. 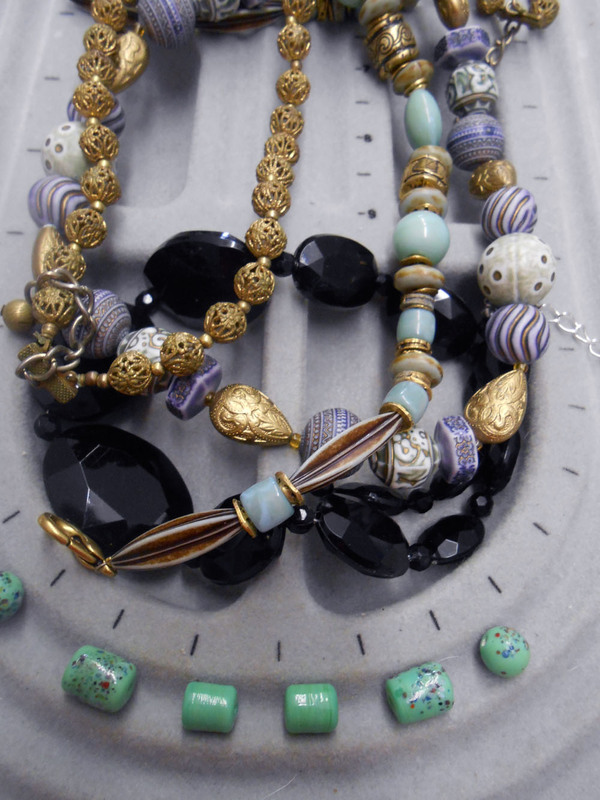 Look for glass, porcelain or semi-precious stone beads in pieces at the thrift store – look beyond their current design and see if they can become something new. This entry was posted in beading, recycled creations and tagged beading, jewelry, recycle. Bookmark the permalink. I LIKE your new creations !! I will keep them in mind the next time I see “jewelry” in a garage or estate sale!! Nice blog Elizabeth!!! Appreciate these beautiful necklaces even more after seeing how they were made! Ditto with Joy and more beautiful in person. I love it! Thank you, Betty! Beautiful creations! You have such an eye for the right combinations Betty! Keep going, you have so much to offer.